Combine persimmons with sugar in blender or food processor and process on high speed until very smooth, about 30 seconds. Pour through a strainer to measure out 2 cups of purée, reserving remainder for another use. 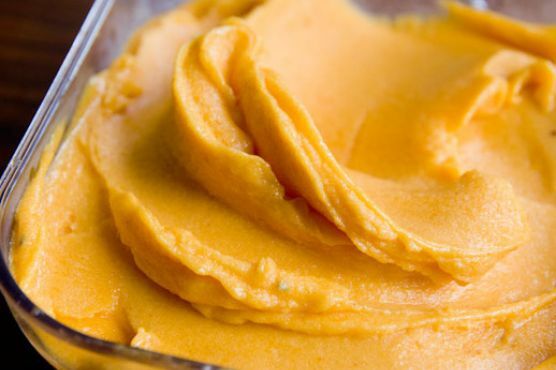 Transfer purée to a medium-sized mixing bowl and whisk in tea, lemon juice, and salt to taste. Chill in freezer until mixture is very cold, 2 to 3 hours. Churn in ice cream maker according to manufacturer's instructions. Serve immediately as soft serve or transfer to an airtight container and chill in freezer for 4 hours for a firmer texture. Cream Sherry, Moscato d'Asti, and Port are my top picks for Frozen Dessert. A common wine pairing rule is to make sure your wine is sweeter than your food. Delicate desserts go well with Moscato d'Asti, nutty desserts with cream sherry, and caramel or chocolate desserts pair well with port.